Many packages exist to add video effects onto full frames of video. For example, iMovie, Final Cut, Premiere, etc. 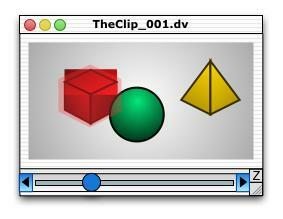 These packages are made such that you can edit and apply effects to clips of video which encompass the entire frame. LlamaVision does something similar, but in a different way. LlamaVision has regional effects. That is to say that on the frame of video, you select a region in which an effect is to affect. (heh) There can be an almost unlimited (meaning that I have not yet defined it) number of regions on each frame of video. A whole bunch of Effects plugins, as well as a plugin SDK. Patience will be a necessity as well. 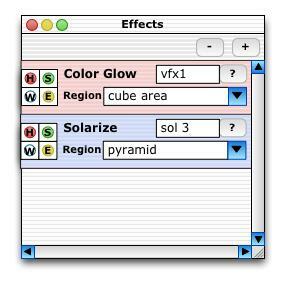 a compositing tool... use Shake or Final Cut. This is the listing of available regions. 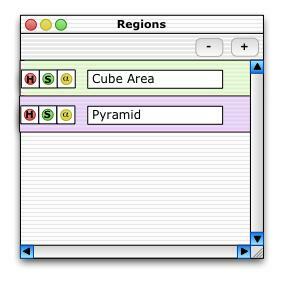 It lets you add or remove regions. You can (H)ide or (S)how the clip, display just the alpha generated from the region, or change the region's title. 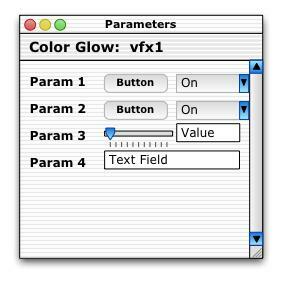 This lets you edit the parameters for each of the effects. It is generated dynamically when the effect loads, based on the parameters that the effect needs. Here's the original, horrible, concept for the gui. Construction of the prototype (in Carbon) was in progress. Note: This has since been junked. LlamaVision will initially be given out free for personal use. If you are going to be using it in a commercial environment, there will be a site-license fee, although you can evaluate the product for free to decide if you want to send me cash... The executables will be identical in both cases. If you like using it, send me money! (I am perhaps too trusting... so be it.) Although, since there isn't a lick of code written yet, this is all moot.